I think it may have been looking up at the ceiling in St. Peters in Rome in 2012. Unique. Replete with history. A remarkable artistic collaboration. Scale and History, all in one place. Remarkable! Or perhaps it was my many years as a young choirboy, fifty decades earlier. Staring at the ceilings of many English churches and chapels, but especially my own school chapel, trying to pass the time, while earnest and well-meaning men of the cloth preached The Word. Unfortunately this young person did not understand much about the deeper message of The Gospel; not until six years later, when I sat for a Divinity A-Level, and then got a passable B, much to most people’s surprise, not least my own. Perhaps I had taken in more than I realised. Or was it an innate fascination in architectural form itself. After all, I had started to produce a pattern of personal photography of architectural elements involving symmetry and tonal abstraction about five years earlier? 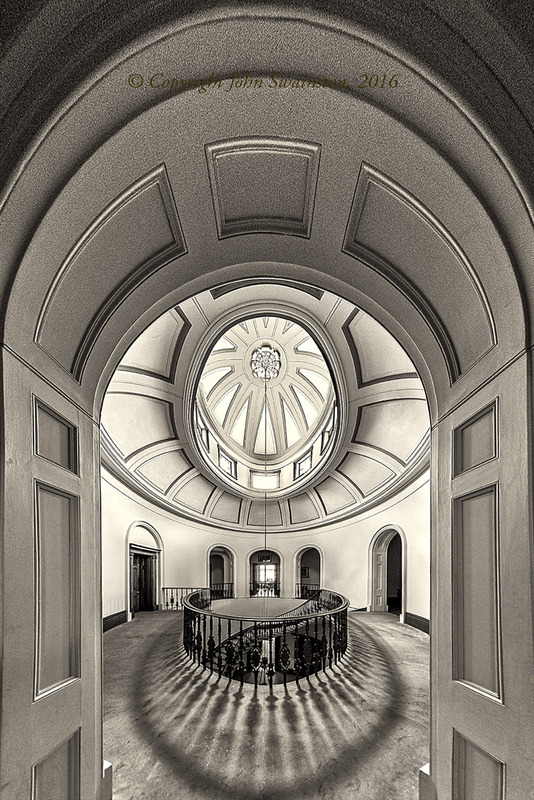 In any event in 2016 this quiescent fascination with symmetry produced a body of monochrome images titled Looking Up, as part of the St. George Leagues Club Photographic Society Group show, for that year’s Head On Photo Festival in Sydney. It had started as studies of modern buildings on the outside. Peer review and great coaching by Professor Des Crawley, formerly of Western Sydney University, had helped greatly in the journey, as did the opinions of my fellow Society members also embarked on their own creative journey. Images included monochrome photographs of Elizabeth Bay House in Sydney, Gaudi’s home in Barcelona, the Queen Anne staircase in Greenwich, London, The Queen Victoria Building centre in Sydney, and the heritage ceiling in the Block Arcade in Melbourne. They were all presented with a point of view which the eye would seldom see, or which only the camera lens, suitably managed, was able to create. The pictures took the subject beyond reality through abstraction and tone. They were intended to make the viewer dwell awhile as he or she decoded them. I offered them for sale; no takers from the audience in Kogarah library in which they were displayed. I felt rebuffed, unvalued. As an Australian born in England I have travelled back quite regularly, mainly for business. In July 2016, knowing I was to be in Europe in September that year, for the bi-annual Photokina Expo in Köln Germany which I had visited since 1972, I applied to five Anglican Cathedrals and St. George’s Chapel Windsor in England, to make photographs of their interiors. I had visited St. George’s Chapel the year before, but was disappointed that photography was only possible if applied for. I was told firmly that only a few would get through to acceptance. I wanted to focus on the varied ceilings of each building, to see what I could make of them. Permission, after some reminders to some, was, I was somewhat surprised to see, granted. Over 4 days I made photographs of Chichester, Winchester, Salisbury, Oxford and Norwich. In October, two weeks later, after Photokina, I returned to Windsor. I started this project, using the highly regarded Nikon D750 camera, Tamron 15-70mm and 28-300mm lenses, and a Samyang 8mm Fisheye lens, on a Velbon carbon fibre tripod, chosen for lightness when travelling. I learned that the sun is not your friend if its brightest spots fall on the wrong places. I learned too that absolute precision in placement and alignment of camera equipment is essential. I also learned that a ‘pan-tilt’ tripod head is no match for the precise placement required to obtain the symmetry effect I was seeking. Nonetheless, reasonable images were made. They can’t be shared in social media under the terms in which most of them were made. But my idea was realised, I was interested in future possibilities. But no sooner had I returned to Australia than a new commercial client emerged and work completely swamped my next three months. It was not until Christmas Eve, of December 2016, the initial English Cathedral project almost now out of mind, when my daughter Nathalie gave me what has become a very proud and extremely informative book, as her Christmas present to me. It was a first edition of the 1902 An Illustrated Guide to the Cathedrals of Great Britain, published by Dent, written by the Revd. P.H. Ditchfield, of Barkham Rectory. Ditchfield, it turns out, was a prolific author, covering The English Village and many other subjects. He lived to a ripe age, writing until 1930. You can even purchase this book today as an Amazon Kindle download for under $4.00. Wonderful that modern technology brings these fine volumes back to life. The treasure for me, truth to tell, is in the physical book. Its fading green cloth cover, the almost invisible gold top-edge printing remaining, and the roughly cut pages of this 452 page masterpiece connect me directly with the era of its authorship. As I read through the opening pages I was mesmerised. Could I perhaps entertain the thought of recording the rest of the Anglican Cathedrals? There were 37 listed in Ditchfield’s 1902 book. I checked the current listing in the Anglican directory of the Church of England on the Internet. There are 46 today. I felt additionally that both St. George’s Chapel and Westminster Abbey should also be included, and the glory of former Cathedral Bath Abbey surely should also make the cut. Now there were 49 buildings to be considered, should I proceed. I tried to find a logic to also include King’s College Chapel, Cambridge. It’s a Royal Foundation, started by Henry VI in 1446 and completed in the reign of Henry VIII, the first Defender of the Faith. “FID DEF” it says on British coins – that’s what it means! Henry VIII was effectively founder of the Anglican Church, as he wrenched it from Rome, over a personal divorce issue, and the resistance of the troublesome and recalcitrant Thomas Moore as Archbishop. Well, it’s a fair stretch! There is no doubting the glory of the building at King’s, made famous in the 1950’s by the Decca recordings of the service of Nine Lessons and Carols under then Master of Music, Boris Ord. In fact the author of The Cathedrals of Britain, – David L. Edwards (1989) who was a curate at our local parish church in Hampstead in the fifties, was Dean of King’s, Cambridge late in the 1960’s and Rector of St. Margaret’s Westminster, in which I was married, in the 1970’s. So perhaps there really were compelling reasons that it be included, even if many of them are very personal. And it would make a neat and tidy fifty remarkable church buildings, all with great history and most of wonderful beauty. Oh well, I thought: I can but dream. But the idea was well and truly born. In July of 2017 my wife and I travelled to Europe largely for a holiday, with some business thrown in. I also could not resist adding St. Paul’s and Southwark Cathedrals to my collection of Cathedral ceilings, again by prior appointment and licence. I was beginning to see some possibilities for an exhibition. I discussed it with a few people who I respect, who stated the idea had merit, but they’d have to see the work. In the case of St. Paul’s the sun once again was a challenge. But so much pressure did I feel under, I also made a significant technical error, failing to turn off the anti-shake feature of my lens, which resulted in many defective images, with the camera mounted on a tripod. Only the next day did I work out what had gone wrong. I almost gave up, so desolate was I at my own stupidity. But I sat down and developed a written checklist as a practical solution, to prevent recurrent error, just like pilots use checklists to operate airplanes safely. So do medical teams in surgical theatres. Now I check off every item on the pre-shoot list, and the remainder on arrival at the venue and during and after the shoot. As we also visited Prague and Vienna during our July visit, I was able to make pictures in St. Stephan’s in Vienna and the great St. Vitus Cathedral, up on the hill, in Prague. 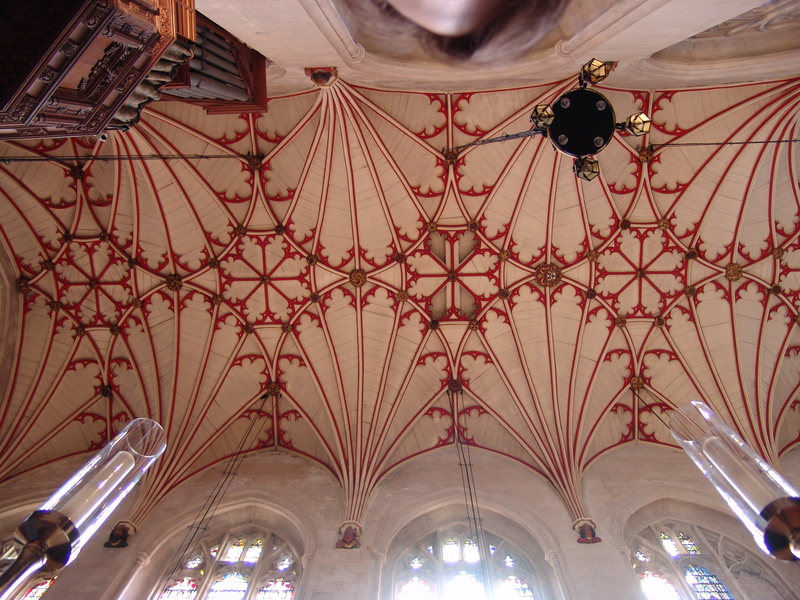 Though not of the same considered kind of images I was making in England, they reinforced in me that all these buildings merit much greater examination by visitors when it comes to observing the remarkable vaulting, construction and architecture of the roof above their heads. St. Vitus Cathedral, Prague, Czech. 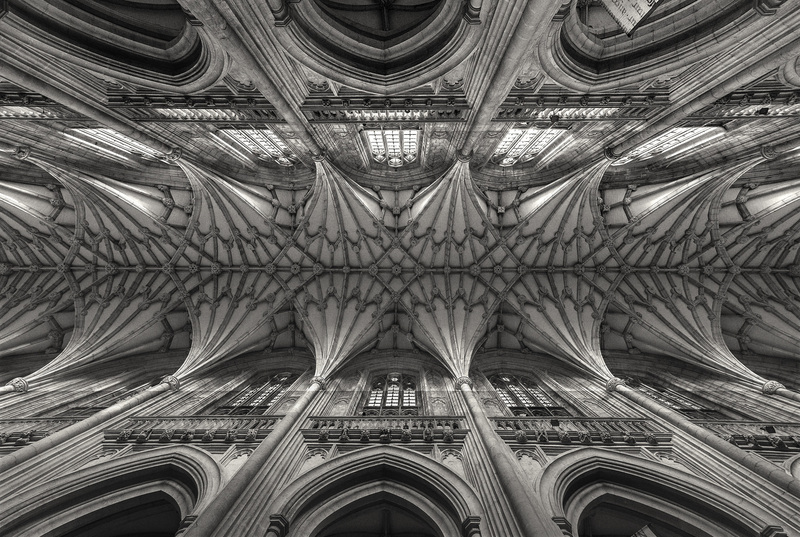 While still in Europe in July, I resolved that I would make a complete body of work of the ceilings of all Anglican Cathedrals of England and Wales. I had seven done, so that only forty left to complete the work, and the three others I felt worth adding! I knew I couldn’t get away for more than two to three weeks at a time. Growing grandchildren, important commercial clients and other directors’ duties would preclude doing it at one stretch. And besides, planning 40 visits in one stretch suggested an exhausting process that would most likely suffer through fatigue, illness or both, reducing the quality of work. It would also prevent me enjoying some of the fine liturgical music that Evensong and Matins produces in these Cathedrals. And so it was that October 11th 2017 was deemed to be the start of the major push to break the back of the work, over two weeks, averaging two Cathedral sessions a day. If I had actually measured the miles of travel involved, rather than using Google to tell me how long each journey would take, I would not have been so ambitious. But there it is, and so, that’s what I set out to do. The journey was planned: 20 cathedrals over a 15-day period, including four days of weekends, in which photography is not possible. Much correspondence over the weeks that followed, much of it substantially later than intended, due to family illness and work pressures. But the trip was booked. In Part Two of this Story – my next blog next week, – I will relate Week One of the 15-day journey, just concluding. Andrew Powers, of Winchester College Chapel. A remarkable project and one to test your powers of endurance. Remarkable captures and the finished article will make for a great book and exhibitions. 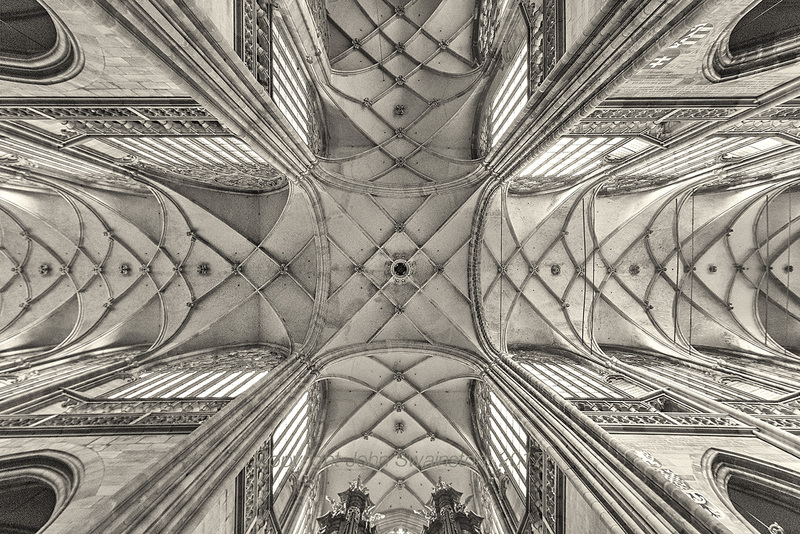 Your images of those wonderful Cathedrals ceilings are just perfection John, congratulations on your inspiring project. Excellent article. Looking forward to reading the later parts. I agree with Tony, an exhibition and presentation on the project would be very welcome. Thanks Peter. Yes, I think it’s developing into something of long-term value. Like all self-commissioned work the journey is sometimes very lonely and discouraging, but then filled with overwhelming joy when you see something that is truly powerful and unique, and in some way you manage to capture some of it. Gold Coast? John, I have been privileged to see this project go and grow as you have researched, explored, sorted and sifted material. The recent posts offer much promise for the final compilation be it in book and/or exhibition form. Your blog is a great read but it is more. It offers insights into the thinking, the creative journey, into the the analytical mind behind this growing body of work. So, I can celebrate the imagery for its sublime, reverential and elegant style and I can marvel at the documentation of the thinking -the thought processes that underpin your creativity. This is a rare pleasure, indeed. Please let me know if you plan, or have a speaking engagement about this project, so that I may attend.